It happened: I hit PUBLISH after the draft only version. Every blogger’s worse nightmare. Forgive me. I’ll edit and be back ASAP. The Whole Language Umbrella conference in Tucson was wonderful, and I will share a few highlights, in no particular order. First, What Is Whole Language? Thank you Donalyn Miller for reposting this definition from Connie Weaver and colleagues from Michigan (1995). Click here to read. 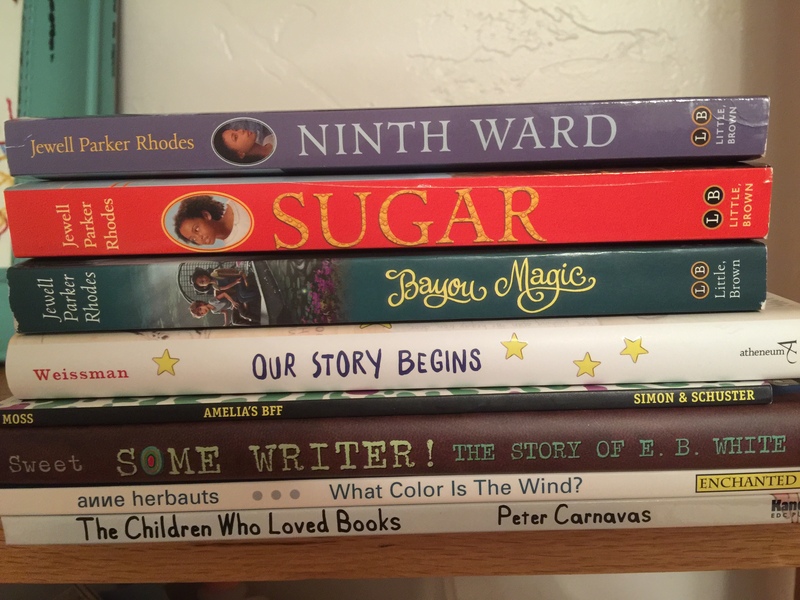 Jewell Parker Rhodes was particularly inspiring for me, as she spoke about writing for children now, as a way of giving back. She was one of those people, who was saved by books in her childhood. I was lucky enough to buy 3 of her books. Click here to read more about Rhodes. The following photo is a stack of books which I bought on from Kid’s Center (click here) at the conference. Ken and Yetta Goodman’s extensive collection of books/reasearch (a.k.a., treasures) will be housed at the University of Arizona (UofA). 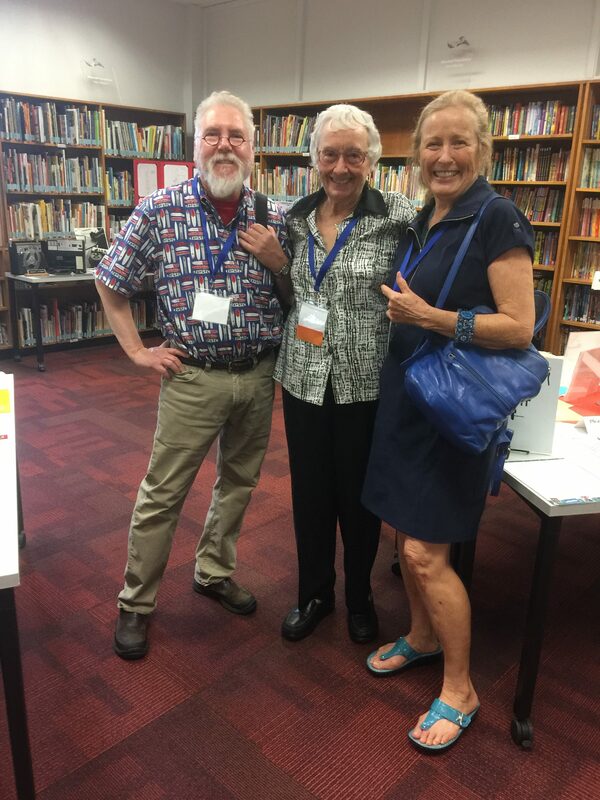 In the photo below, Alan Flurkey, Yetta Goodman, and I celebrating in the World of Words (WOW). Kathy Short of the UofA has created a lasting legacy with her WOW. It was a complete joy for me to finally meet the author/artist/illustrator, Joan Sandin. For more about Joan Sandin, click here. 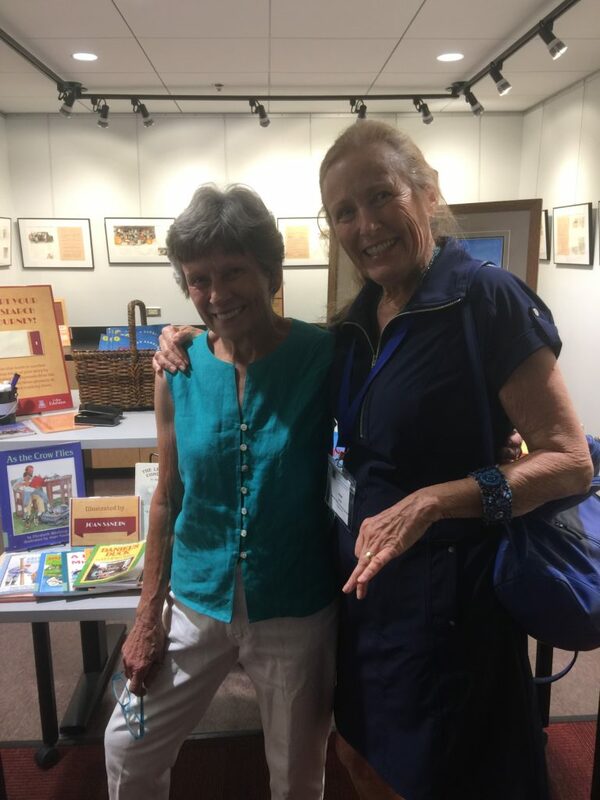 Of course, I am very interest in her book, “Coyote School News,” as it celebrates Sister Bourne, one of my all-time heroines. In the 1970s, while teaching in Benson AZ, Sister Bourne’s books had a powerful impact on my teaching/learning. Click here for a little overview of Sister Bourne and the students she taught in AZ. More on Sister Bourne to be coming in WinkWorld. Perry Gilmore (click here for more on Perry ) closed this wonderful conference with the story of her son and a little boy from Kenya, who generated their own language: A beautiful, fascinating, and heart-wrenching story. You can read about it in the book, Kisisi (Our Language): The Story of Colin and Sakiki. Click here. If I were teaching translanguaging or language acquisition, I sure would add this book to the course syllabus. Translanguaging: What in the World is That? Dr. Curtis Acosta opened the conference and was a highlight of the conference for many. Dr. Acosta, as many of you know, has been a central voice in the struggle to save the Mexican American Studies program in Tucson. As he was speaking, the final day of the court case was in session. Jesse Turner on FaceBook has the best photos of the ppt and quotes, which Dr. Acosta shared. This trial has been widely publicized and is readily available on the web. As the Whole Language Conference came to a close, I reflected on the many moments of synergy throughout the conference. I had the amazing experience of connecting with friends and colleagues of many decades and many different contexts. Thrilling. As Perry Gilmore was presenting late on Saturday afternoon, yet another monsoon storm hit Tucson. I could hear the various storm warning sirens coming from the hotel hallways and various phones. My car was parked a mile across campus, but it was still light, and I was wearing all cotton, so I headed out into the rain storm. There were places where I could not cross as the water was running too hard and too deep. As I came around Old Main, a huge rainbow was hanging in the East, right over Cascabel. I continued splashing across the grassy mall alone with only the rain, the rainbow, those palm trees, and me. I will forever treasure this experience. Thank you Tucson area Whole Language Umbrella for giving me this wonderful memory. Mark your calendars: NCTE (National Council of Teachers of English), which sponsors WLU.